A few weeks back, something remarkable happened. Eric Samuelson, a beer fan who lived for a time in Oregon but who relocated to the DC area, sent me a package of beer. For no particular reason other than he wanted me to try some of the good beer he was tasting there. I would very optimistically love this to be a regular feature. I encourage everyone from around the country--nay, around the planet--to send me your good, locally-brewed beer. And, if you do that, the least I can do is offer a few comments on what I've received. (I don't expect it. I would be a lot of money against it. But you never know. Email me and I'll give you my mailing address.) All right, then, onto the beers. 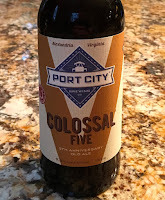 Patrick and I reviewed two of these on the Beervana Podcast--Cigar City Hot as Helles and Port City Optimal Wit. Since I received the package, Cigar City has sold out to private equity, anticipating Eric's comment ("Enjoy it before they get acquired by ABInbev.") It is not a DC-area beer ("I just had it sitting around and it fit in the box") and it was the least impressive of the batch. A helles lives and dies by malt character. If there isn't a subtle symphony of flavor, it's just a boring little lager, and I guess I'd put this beer in that category. The malts were sweet, and generically so. We've got another Port City down below, so I'll mention Optimal Wit with it. This was the beer that precipitated the care package. Eric comments, "I think this is the DC area’s version of Heady Topper or Pliny the Younger." DC Brau used the Falconer's Flight hop blend exclusively in the beer. My notes: "Wonderfully fruity aroma--orange, mango, and something slightly dank/savory. Pretty thick mouthfeel. Lots of flavor, not a ton of bitterness. Strong hoppy beers have a strange acidity that seems to singe my mouth." It seems like a wholly worthy member of the crowd of sticky modern hop bombs, though I didn't personally love it. That's not surprising since I love only a tiny number of these kinds of beers. They strike me as too intense, too crowded, as if an addled writer kept using the same page of notebook paper to write a novel. But you'd probably love it. Eric comments that it is, "well regarded, but I thought it was only OK." My notes were similar. "A well-done fruit IPA, with the actual fruit flavors (orange and grapefruit juice, "citrus" zest) fading more towards bitter rindiness. The zest provides a dry, bitter finish, but otherwise the fruit my be hidden. A bitter spine. Nice but not sublime." One comment I'll make here interstitially is that the above two beers are good examples of why the designation "West Coast" no longer has any meaning. They are typical of the beers I found around the country last fall. Basically, the American interest in hops has become universal, and we're all making them the same way now. And please do not mention Vermont. Eric's comment: "DB makes wonderful beer in general and this is their standard bearer." I agree about the brewery; it's one I admire a lot, and they're cited in the Beer Bible. But I've been underwhelmed by this beer, and was again. My tasting notes: "Beautiful amber-copper. Toffee malt aroma. A bit too sweet, and the malt character is generic. I would like a distinctive flavor in these malts, and a drier, crisper finish." Like helles, this style depends on distinctiveness in those subtle elements. The brewery uses several malts, and that may actually be the problem: with fewer, the flavors might shine through more brightly. The last two come from Port City, and they were the two best beers (by my lights) in the pack. Eric's comments: "This is my neighborhood brewery. They have a great line up; this is on tap everywhere around here..." I don't have notes--listen to the pod!--but it was really superb, dominated by crisp freshness, and only accented by spices (as opposed to being oppressed by them). It contains grains of paradise, and I hate grains of paradise. Usually. The spice is so strong it's almost always overused. Clearly, though, when used in the right amount, it can be great. Eric hadn't tried this yet, but said it was getting great reviews. I see why. 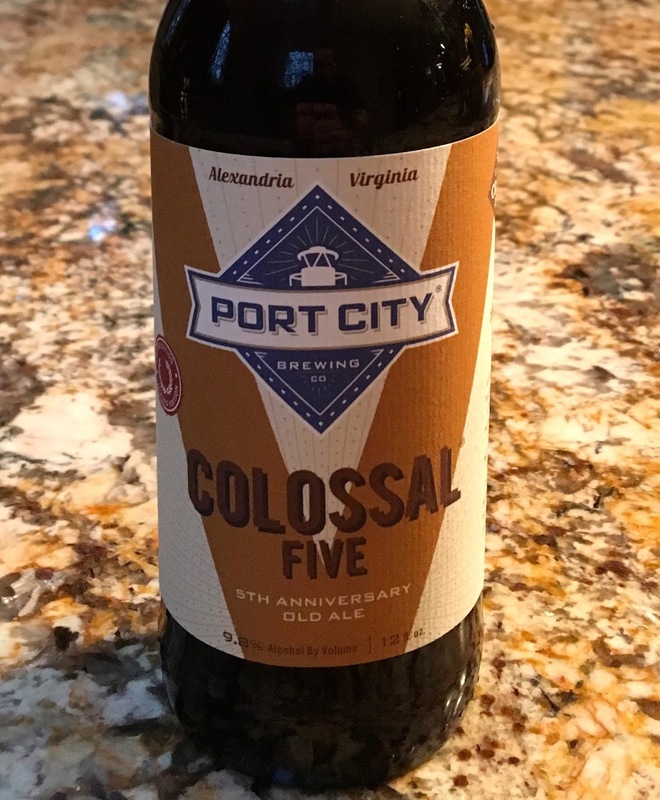 It is their fifth anniversary beer, an English-style old ale. My tasting notes. "Wonderful aroma of stewed fruit with a bit of toffee. Smells like 19th century London kitchen. Bread pudding. Great malt character; sweet, but leathery. Very rich. Lovely beer." This was one of those rare and wondrous beers that shakes you out of analytic objectivity and puts you into a mood of poetry and metaphor. You are searching for flavor descriptions and find your mind wandering off into smiling reverie. I would love to have a steady supply of this beer--and I'd love to see what it would taste like if inoculated with a bit of Brettanomyces Claussenii. Really exceptional beer. Thanks for the beer, Eric! And thank all of you future participants in this ongoing series. If "West Coast" has no meaning, how does "Belgian" pass? Scarce as it is in its eponymous country, this adjective is found in IPA variants worldwide. That, sir or madame, is an excellent topic for a blog post. I've got a few examples of Iowa beer from Toppling Goliath, and some others from Albuquerque, that I brought with me to PDX. They're getting a bit older (I brought them last July) but I'd be happy to share if you're out and about sometime soon! So far, from what I brought, I've had Toppling Goliath Rover Truck coffee stout that held up well to about a year of refrigeration. It's not a strong as, say, 3Magnets recent coffee stout, but pretty well balanced with the darker malt bill keeping it away from 'sweet'. From Albuquerque, I've got one can of La Cumbra's Elevated IPA. It's similar to your other super-hoppy IPA's but with a cleaner, crisp hop profile that doesn't linger in 'muddy' territory very long. It's been in my top 3 IPA list for a few years now.